On April 22, 2018 in the Antioch neighborhood of Nashville, TN a senseless act of violence occurred that took four lives and injured two others, at a local restaurant. Immediately a #HOPEAlert was issued to our network of volunteers. Volunteers quickly begun to create Stars of HOPE for the community of Nashville. Many of these Stars of HOPE created by New York Life (NYL) employees of the Knoxville, TN office. This was not the first time an NYL office has responded with Stars of HOPE and healing through art. Eric Wolfinbarger (left) and Justin Hayes Wolfinbarger (right) with restaurant employees in Nashville, TN. When tragedy affects a community we strive to remind others to maintain hope. Sometimes within days, but in this case it took several months to find the right connection. Stars of HOPE were delivered right before the holidays when two long-time supporters, Eric and Justin Hayes Wolfinbarger reached out to collect and distribute Stars of HOPE. 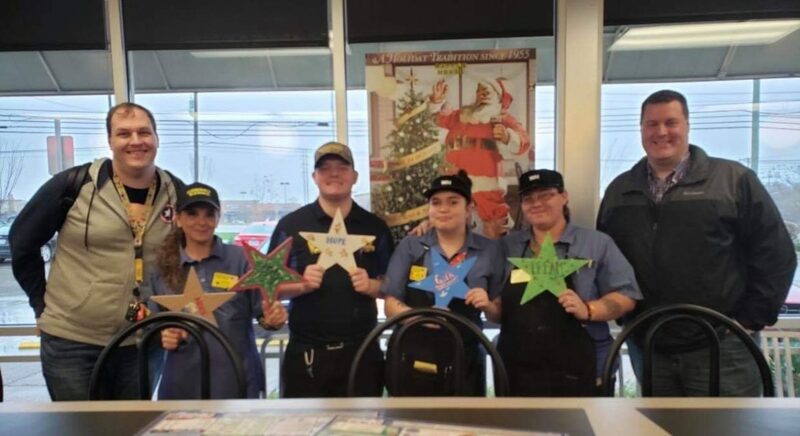 Eric Wolfinbarger and Justin Hayes Wolfinbarger became a Hope bank for this community, they took the initiative to deliver Stars to the restaurant staff to let them know they are not forgotten. While on their journey to deliver Stars of HOPE they were able to meet with the family of Akilah Dasilva whose life was taken that day. The family including Akilah’s Mother and Akilah’s two brothers invited Eric and Justin to their home where they were given the Stars of Hope. Eric stated “It was such a heartwarming experience! They were all so wonderful and welcoming”. The family offered to take stars to other victims’ families and to the survivors as well. We continue to hold everyone impacted in Nashville in our hearts and hope you continue to heal. Thank you to New York Life employees in Knoxville, TN and thank you to Eric, Justin and to all the volunteers who paint, ship, deliver and hang Stars of HOPE – together we heal. Stars of HOPE® USA is a disaster response and community arts program empowering people to transform communities impacted by natural and human-caused disasters by creating and displaying colorful art and messages of hope and healing. In 2007, Stars of HOPE® started with two families – Today, with the help of over 90,000 volunteers, Stars of HOPE have transformed over 220 communities in 26 countries impacted by disaster and tragedy with messages of hope, healing, and resilience. Thank you to our National Community Sponsor KMPG, LLP. Stars of HOPE® is a registered trademark of New York Says Thank You Foundation.